Consider the following dataset that specifies the type of contact lenses that is prescribed to a patient based on the patient's age, astigmatism, and tear production rate. The purpose of this problem is to use information theory, more precisely entropy (or disorder), to construct a decision tree that predicts the type of contact lenses that will be prescribed to a patient based on the patient's attributes. The partial decision tree below shows part of the decision tree constructed by using the entropy (or disorder) based algorithm. In this problem, you are asked to finish the construction of this decision tree following the entropy-based algorithm. In other words, you are asked to use entropy to select the attributes that will appear in the right subtree marked with a ??? above. (15 points) Use the entropy formula to rank the attributes that can be used in the subtree marked with a ??? to predict the target/classification attribute (contact lenses). Show all the steps of the calculations. For your convenience, the logarithm in base 2 of selected values are provided. (7 points) Remember to continue constructing the subtree until all the branches end in nodes with a homogeneous classification of the attribute contact lenses. That is, each branch ends in a node that contains dataset instances (rows) that have exactly the same value for contact lenses. this branch the tree will have leaf soft. this branch the tree will have leaf none. Consider the following approach to training a neural net that uses genetic algorithms instead of the error backpropagation algorithm. 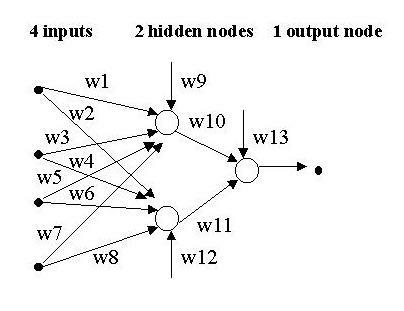 Assume that we are training a 2-layer, feedforward neural net with 4 inputs, 1 hidden layer with 2 hidden nodes, and one output node. The output node produces an output that is a real number between 0 and 1. Also, assume that we have a collection of n training examples to train the net, each one with a desired output, which is also a real number between 0 and 1.
plus 3 links, one for each of the hidden & output nodes, representing the node's activation threshold. The fitness of an individual must represent how close the output computed by the corresponding net is to the desired output over all the training examples. The higher the fitness of an individual, the better the corresponding neural net computes the target function. The net corresponding to an individual is the neural net in which the 13 weights of the connections are as specified by the values in the individual. (6 points) Propose a suitable fitness function. That is, describe in detail a function f that receives as input an individual (i.e. a tuple of 13 real numbers) [w1, w2, ..., w12, w13] and outputs a real value that represents the fitness ("goodness") of the individual. Explain in detail why your proposed function is an appropriate fitness function. each training instance, and n is the total number of training instances. the sum over n instances will not give a number larger than n.
In this manner, the highest error is n, giving a fitness of 0 (the worst fitness). The lowest error is 0 (perfect), which yields a fitness of n (the best fitness). Describe in detail the genetic algorithm (or sequence of steps) that you would employ to search for the right values for the connections' weights of the neural net using this evolutionary approach. being a tuple consisting of 13 randomly generated real numbers. (5 points) Selection. Explain the procedure you would follow for the selection step. covered in class (e.g. ranking method, diversity, etc.) would be fine. distribution to make our selection choices. (2 points) Cross-over. Explain the procedure you would follow for the cross-over step. the rest of the array positions will come from the second individual. (2 points) Mutations. Explain the procedure you would follow for the mutation step. (5 points) Termination condition(s). What are the termination conditions of your evolutionary algorithm? (6 points) Overall procedure. Describe your genetic algorithm that combines selection, cross-over, and mutation to perform the search for appropriate weights for the connections in the neural net. (2 points) Output of the genetic algorithm. Explain what it is returned as the output of this search using your genetic algorithm. The best individual produced, namely  BestInd in the algorithm above. Consider the problem of automatically understanding which objects are present in a 3 dimensional scene from (a subset of) its 2 dimensional digital images. A 2 dimensional digital image is just a matrix of pixels. For each pixel, the matrix contains the pixel's grayscale value. (9 points) Determination of shape. groups (or regions) of apparently related pixels. These groups of pixels will be called "objects" from now on. from shading, texture, and motion information. The shape of an object can be inferred from shading, texture, and motion. (9 points) Object Identification/Recognition (for instance, determining that an unknown object in the image is say an obelisk). database of known objects (usually called "models"). needed to deal with rotations and/or translations. the object fits, if any at all. For each of the following stages of the natural language understanding process, describe the inputs and the outputs of the stage. The more complete your lists of inputs and outputs, the higher your grade in this problem. complete words are constructed from the phonemes. information on words and phonemes is needed to help disambiguate. "Fruit flies like a banana", in which the subject can either be "Fruit"
into the system's internal knowledge representation language. tree(s) obtained in the previous syntactic analysis stage. inexpensive". In the last sentence, She="Mary" and they="bananas").